. . me . . . . . . . . . . . . . . . must . . . .
. . . . . . saltstream sea . . . . . . .ness. you will find him fast in his faith. the cuckoo’s sad cries in the woods. you off your journey toward him. among men, he’s waiting for you. to friends and companions . . . . . . .
gold . . . . . . . . . . . . . . . . . . . . . . . . . .
warriors . . . . . . my lord here . . .
out, crossed the ranging waves . . . .
if he just has you, daughter of kings. endures as long as he endures. Editor’s Note: Hover over the hypertext in the translation for a few fanciful readings of the runic sequence, and in the original poem for notes on letters, punctuation, and other matters of presentation—all provided by the translator. An image from one of the manuscript pages is here. But the sequence, read as words, is wildly indeterminate. Old English used inflection, not word order, to do syntax, so order tells us little about relationship. And runes as logograms can’t take inflections. What’s more, as words, they’re all nouns, so any actions (verbs), positions (prepositions), or even negations, we have to infer. We may sort of know what the runes mean in isolation. We don’t know how they mean in concert. Runes as words may be a romantic projection.2 The alternative is to read the runes alphabetically, as letters spelling a single word. Problem is, neither S R EA W D nor S R EA W M spells a word. In fact both S R and W M are intractable combinations in Old English. But that in itself might have signalled to an Anglo-Saxon audience that a game was afoot. The Romantic­­–tinted glasses through which we view these poems can obscure their ludic aspects. Much of the Exeter Book is given to riddle poems whose solutions turn on puns or double entendres. Anglo-Saxon scholars and monks took great pleasure in cyphers and anagrams. Hover over the translation, late and low, for a possible decryption. 2Bragg, Lois. “Runes and Readers: In and Around ‘The Husband’s Message.’” Studia Neophilologica 71:1, 1999, pp. 34–50. Anonymous made this. Untitled, it sits near the back of the Exeter Book, composed ca. 965–75 C.E., southwestern England. A burn hole across the opening lines makes it hard to say who speaks. Maybe a rune stick carved by a lord to send for his lady. If so, the runes in the manuscript also exist in the poem’s fictional world, for the lady to parse, and to heed or not. 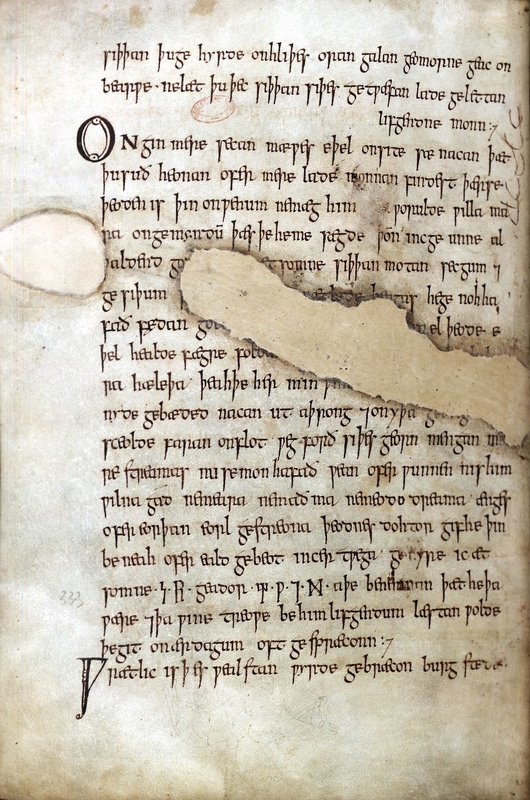 But the rune stick may be a romantic confabulation, the actual speaker lost in the gash—a gash made, ironically, by a piece of burning wood laid across the book sometime in its life in the Exeter scriptorium. If no rune stick, no need to say the runes exist in the poem’s imaginal world. They may exist only in the manuscript—not carved in wood, just inscribed on vellum, a cypher the scribe offers to the reader, part of that inscrutable romance. Christopher Patton is a poet and translator interested in cultural seedbeds, visual and digital poetry, and thresholds of legibility. Three video poems from his current project SCRO are presently showing in “Asemic Writing: Offline & In the Gallery” at the Minnesota Center for Book Arts. His first book of translations, Curious Masonry: Three Translations from the Anglo-Saxon, was published by Gaspereau Press in 2011. A second, Unlikeness Is Us: Fourteen from the Exeter Book, will be published by Gaspereau in the fall of 2017. He teaches at Western Washington University in Bellingham, WA and blogs on this site.